In went the shelves… down came the shelves onto the husband’s head… up went the shelves again with much bigger fixings, and filled with her books and soft toys. The new upcycled corkboard was up on the wall, and covered with homemade polaroids of herself and the family. Her easel was broken down into the chalk and white boards, painted in the wall’s pink and fixed to the wall. A wicker heart the husband spotted in the reduced bin at B&Q was also given a lick of the pink wall paint, and fixed to the end of her bed. Her upcycled chair was placed by her new desk. Her new reading lamp (IKEA’s SNÖIG, £15 ) was installed. An ebay bargain baroque mirror was another upcycle with the wall paint. All the small finishing touches were finally added. A quick vacuum and dust… and we were done. Far better than we had ever imagined. WE loved it – but what would Bear think of it? She had been defiantly stubborn in her resistance to a ‘new room’. She didn’t want to lose her old bed, her green walls, or even her skanky 1980’s peach carpet. 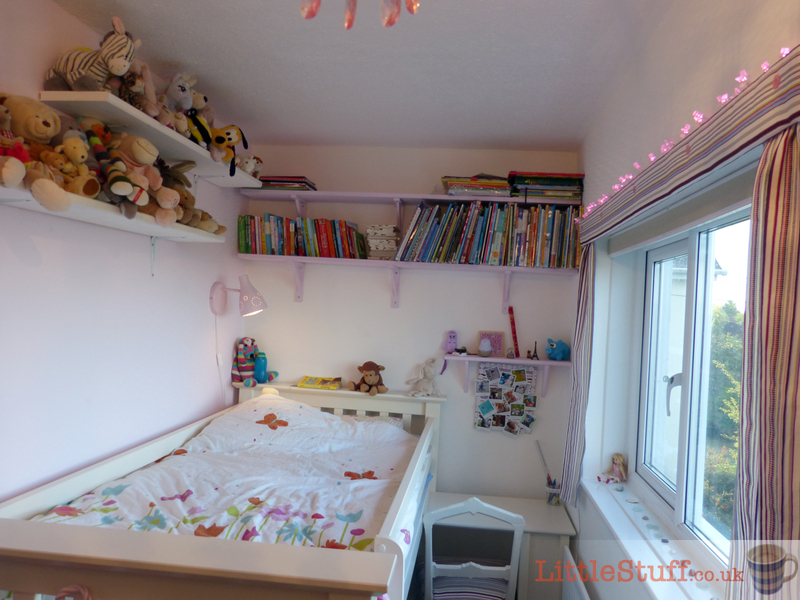 She had sleepless nights with the worry – and we’d consequently had sleepless nights worrying she’d hate the new room. So it was with pride and excitement but not a little trepidation we covered her eyes and walked her up the stairs. I swung open the door as the husband presented her new room with a quiet flourish – and we held our breaths. It made her grin as the door was opened before her. She ooh-ed at the details. 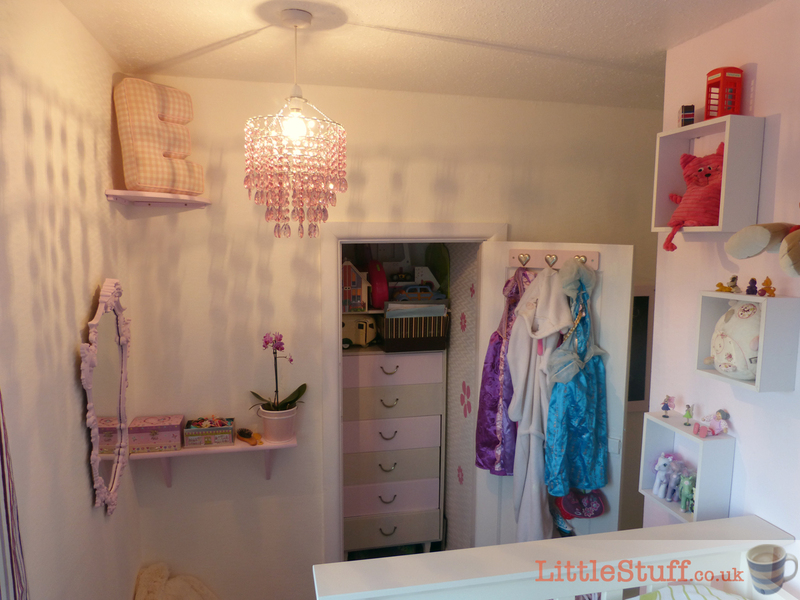 She looked askance at the fabulous girlie pink chandelier light (she’ll grow to love it). She wriggled her toes in joyful delight into the carpet. She clambered into her seemingly-enormous bed (compared to her cotbed), stretched out and star-fished in glee. Then she scampered off to drag her brothers in and gave them the guided tour of the whole room, exclaiming loudly and proudly over every little detail. We watched with tired satisfaction as she explored her very own cupboards. 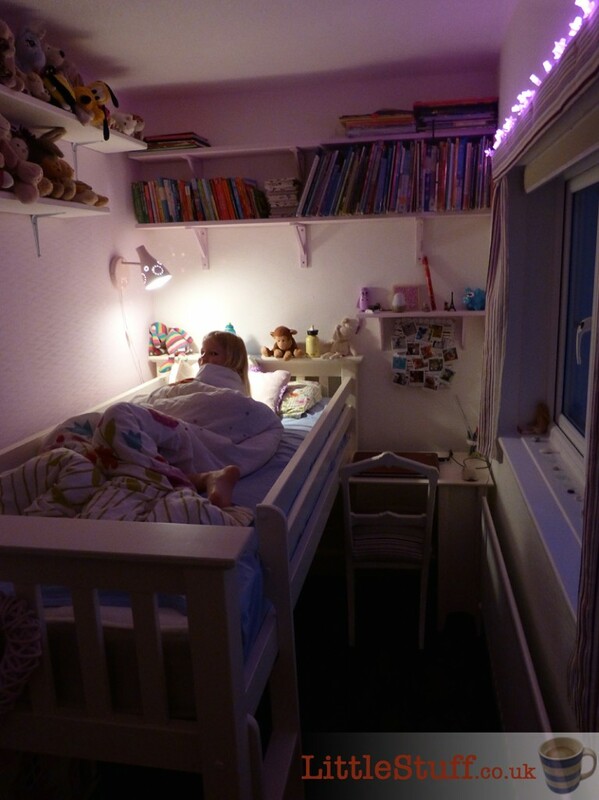 As she ran her hand lovingly along her own bookshelf above her bed. 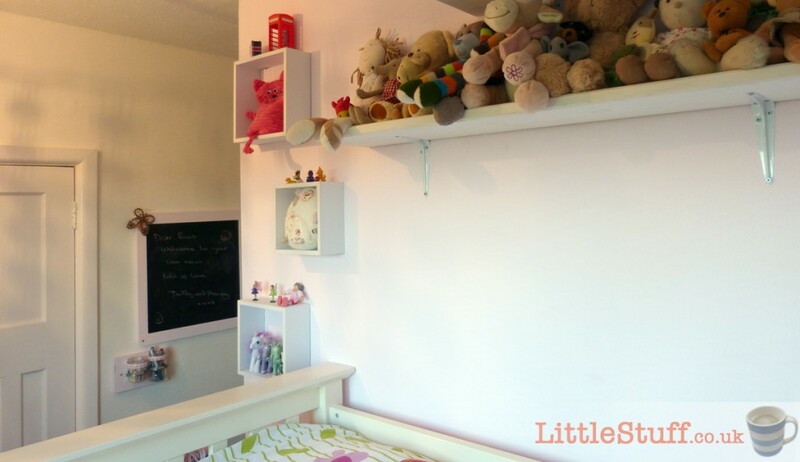 As she clapped in delight at the two shelves crammed with her soft toys – out from under the bed for the first time in her (and their) life. 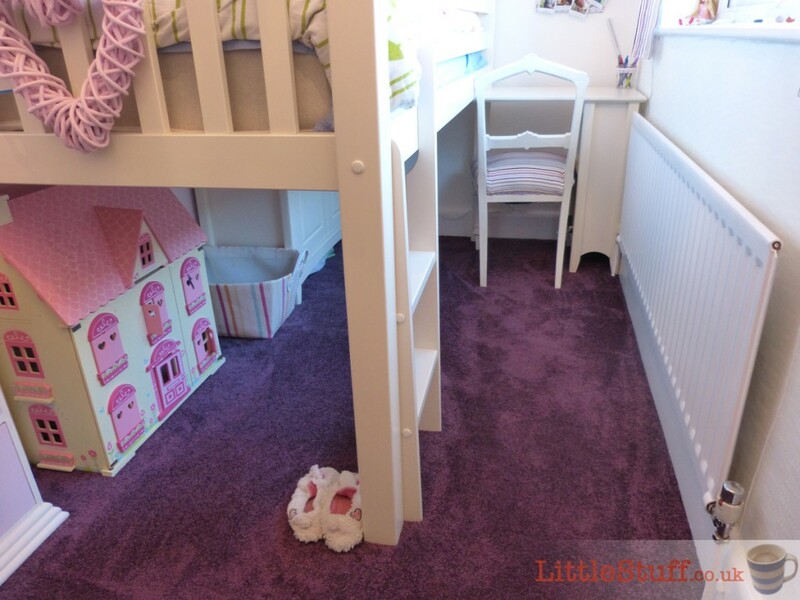 To Cormar Carpets for the properly splendid purple carpet. To Carpetright, for a fabulous bed which she adores, and for unmatchable loveliness in the face of adversity. To Dulux, for their patience and invaluable expert opinions and help. To Spin Collective for their cheerful emergency help which made such a huge difference. To web-blinds for their extraordinary patience, and for starting us down this road so many months ago. It looks wonderful. I’ve been reading your posts on the makeover with great interest because we’re doing a huge house project and I love looking for ideas. Loved the purple carpet! Well done! 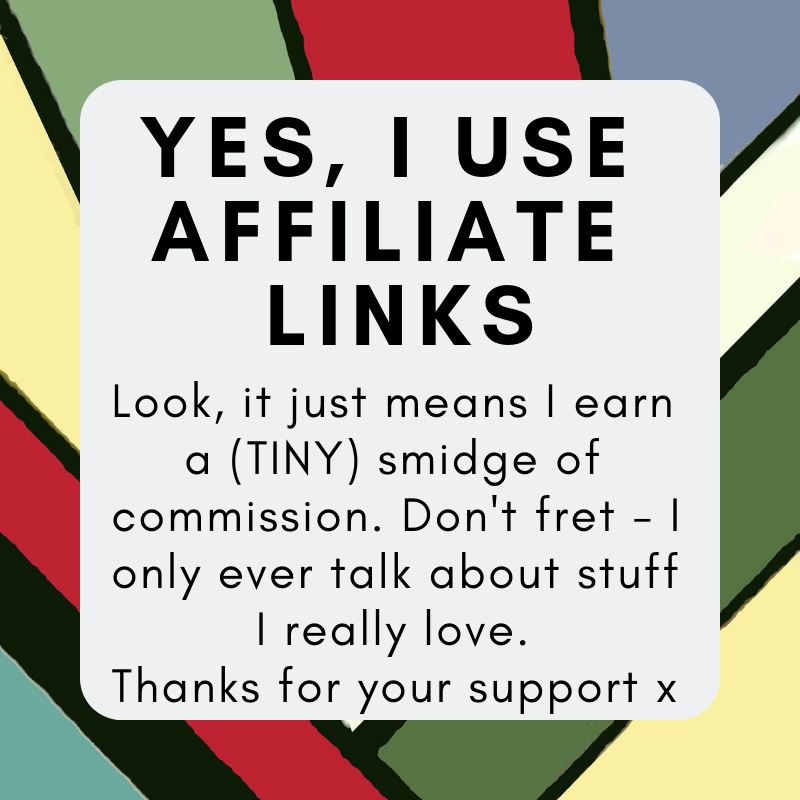 Thanks – it’s been a long time coming so I’m glad we did a good job in the end. 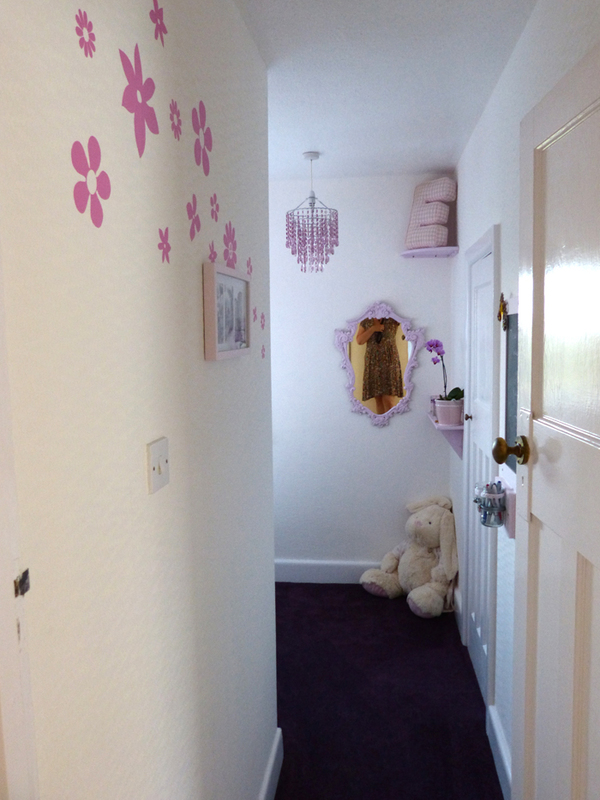 And the purple carpet is probably THE success of the room – and it’s the only bit that she chose not us!